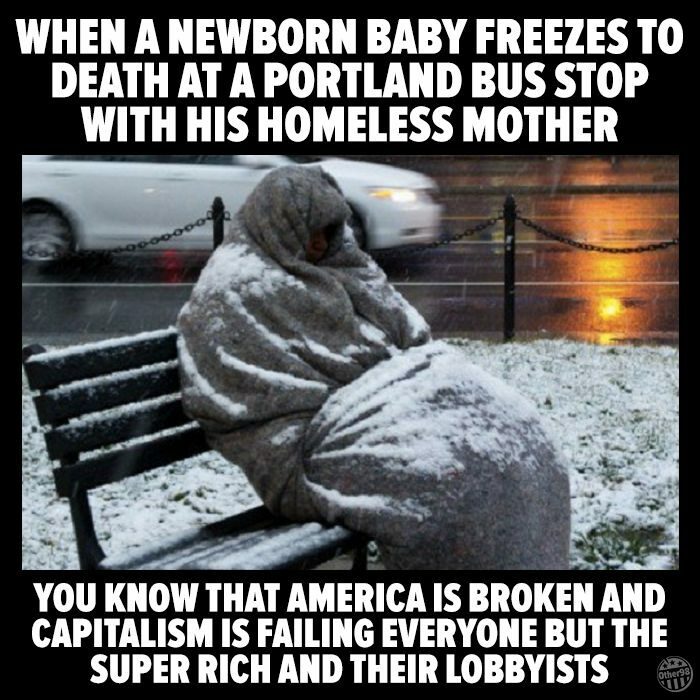 A homeless woman was found holding a dead baby at a Portland, Oregon bus stop, but this photograph does not show them. A photograph shows a homeless woman outside in the cold holding a dead baby. News organizations reported that a homeless woman was found holding a dead baby in Portland, Oregon in January 2017. The photograph attached to the meme shows a homeless man in Washington, D.C. in 2013. First responders told colleagues in text messages that the baby was “conscious and breathing OK, but has been outside this entire time” and was “ice cold.” The child was “born in a transient camp,” one message said. Although two emergency room doctors reportedly told investigators that the baby “appeared to ‘be viable,'” the state’s medical examiner, Dr. Karin Gunson, said the infant was stillborn after performing an autopsy. There are many factors to this story, none less tragic than any other — the fact that many people on the streets of Portland, Oregon (as in many parts of the United States) suffer from untreated mental illness; that this 9 January 2017 death was not the first of the year from possible exposure in the local homeless population, nor even the second, but the fifth; or that the mother of the dead baby is now nowhere to be found. However, this particular meme not only oversimplifies the issue, but uses a misleading photograph in order to do so. Willamette Week. 17 January 2017.